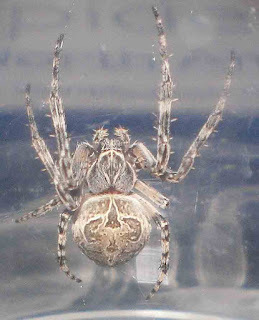 Ron has sent some photos and descriptions of his spiders. I love getting this stuff! 1. A spider commonly known as a bridge spider, or grey cross spider, depending on who you talk to. Proper name is Larinioides sclopetarius. I prefer the common name of bridge spider, since I see them on or around man-made structures almost exclusively. I found this one in my yard at my former house and captured it in a large empty jar to get several photos. Her overall size was about an inch body length. She was likely not quite fully grown. After admiring her for several minutes, and photographing her from various angles, I released her exactly where I found her. She didn’t seem to be much the worse for wear, as she created a web nearby and remained in my yard for several days before disappearing. I assumed she was likely eaten by a bird. 2. This is a great shot of a member of the Theridiidae sp. Known as the common house spider or American house spider. This pretty female lived for a long time in the doorway between the kitchen and living room of my former house and one day I noticed there were babies. I took a lot of photos of her and her new brood of youngsters, and of all the photos, this one turned out best. 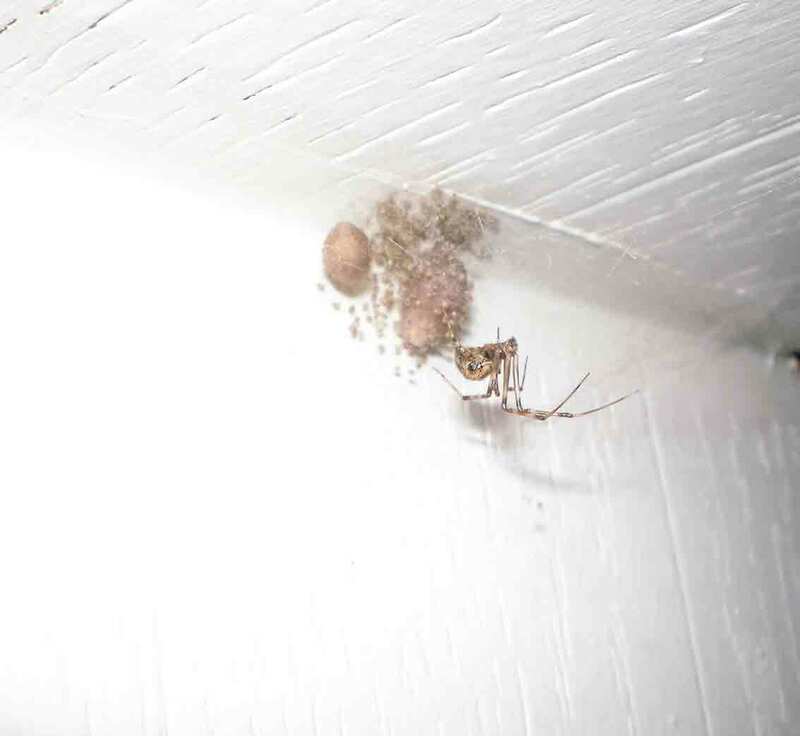 At my new house, these spiders aren’t in the house, but seem to thrive in my garage. I found a dozen there one day while trying to straighten it up. As I saw it would disturb their webs, I finally gave up trying to clean the garage. Anything to get out of work. 2. 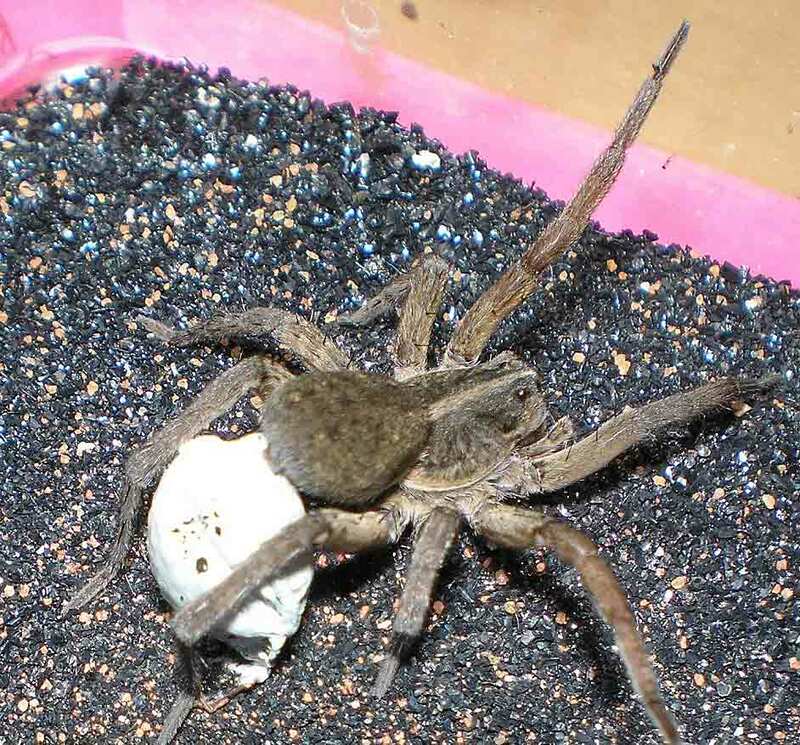 One of the several adult female Wolf spiders I captured that produced egg sacs, which resulted in the six month experience of raising several hundred infants from three different females. 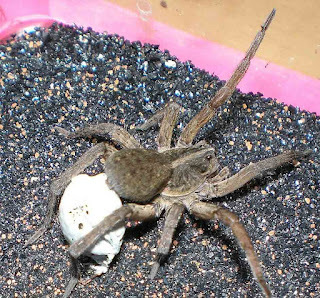 The female I told you about in our chat, the one that I remember watching make an egg sac, was never a mother while in my care, having laid infertile eggs. Known as the Hogna helluo, they have been recently been reclassified as Tigrosa helluo. Same spider, same name, same species, just an update for whatever reason the arachnologists have. It’s all a part of the taxonomy game, I suppose. Lynne, I believe the Gray Cross Spider is now classified as Larinoides sericatus. L. sclopetarius is now recognized as a synonym for L. cornutus. Thank you, Eric. Much appreciated. I'll leave Ron's words as he sent them, with this comment below. I think some of my earlier posts are now out of date with taxonomic changes. 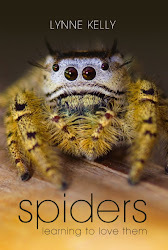 I will get back to spider blogging more now that my new book has gone to press. I've missed my precious spiders!